DALLAS, TX--(Marketwired - Jun 16, 2015) - Parks Associates announced a new connected CE industry report today showing more than 6% of U.S. broadband homes currently own a robotic vacuum cleaner and adoption will exceed 11% by 2020. The report, Robotics: Changing the Way You Live at Home, reports robotic floor cleaners are the first phase of the consumer robotics market, which will gradually expand to include healthcare, home controls, toys, and education. "Home robots are slowly emerging as a new category within the connected home and Internet of Things, but for the near term, most consumer robots will perform single tasks, such as the Roomba vacuum cleaner, which has sold nearly 13 million units since 2002," said Barbara Kraus, Director of Research, Parks Associates. "This area of the market will increase if large mass marketers such as Samsung, Sony, and LG enter this space and, by virtue of their marketing resources, generate more awareness of the category." Robotics: Changing the Way You Live at Home shows growth of commercial robotics is highest in the Asia-Pacific region. China had the highest penetration of industrial robots, with a share of 20% of the total supply in 2013, as well as the largest share of sales in 2013. While static commercial entities are a better fit for robotics at this time, commercial applications and learning will be adapted over time to work in the more dynamic home environment. Countries that will be strong markets for robotic floor cleaners include Japan, the U.S., South Korea, and Germany. Consumer adoption will be most prevalent in high-income households. 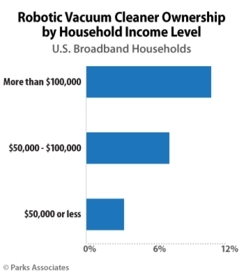 In the U.S., 11% of broadband households with an annual household income of more than $100,000 have a robotic vacuum cleaner, nearly double the national average. "The home robotics industry will grow in small steps globally, and companies in the space have multiple barriers to overcome, including privacy concerns and low awareness on the consumer side," Kraus said. "Our report also analyzes the technical challenges in programming a robot's ability to adjust to a dynamic home environment, to mimic human motion, and to learn from its environment. It's easy to program a computer that can always win at chess, but it is often the simple tasks we take for granted, like emptying the dishwasher, that pose complex challenges to robotics developers." The report identifies leading players in consumer robotics development and discusses applications for the connected home, including a five-year forecast for U.S. robotic floor cleaners. It is available for purchase at www.parksassociates.com. To schedule an interview with Barbara Kraus or to request specific research data, please contact Holly Sprague at hsprague@gmail.com.